The Argonne Forest Post #278 of the American Legion has been in existance since 1920. American Legion honors the veterans of all wars and the men who die in service for our country. The original Legion included members from Brandon, Evansville, Garfield, Moe, Urness and Millerville. 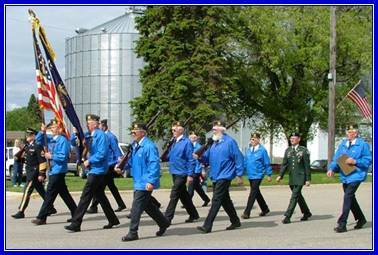 Each Memorial Day, they would march to the cemetery west of town on old Highway #3 to pay tribute to their comrades. 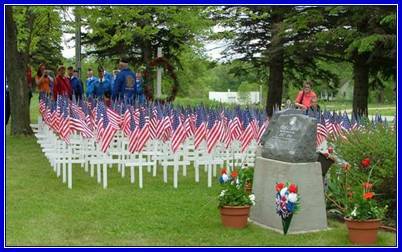 Memorial Day services were held on the Brandon School lawn until the Brandon Auditorium was built in 1936. After a period of inactivity, the Argonne Forest Post #278 of the American Legion of Brandon was reinstated on December 29, 1941. There were 27 charter members. Immediately following WWII, the Post had 117 members. By 1949, there were 192 members, an all time high in membership in Brandon. The membership has been greatly reduced following the institution of Legion Posts in the surrounding towns. Argonne Forest Unit #278 of the American Legion Auxiliary of Brandon was first endorsed on October 29, 1942 by the local Post Officers. Second endorsement was made by the Department of Minnesota in November of 1942. Third endorsement was approved by the National Secretary on January 4, 1943. Thirteen members signed the original charter.